What Are Herbs and How Are They Different From Spices? And How Are They Different From Spices? In the culinary arts, the word "herb" refers to any green or leafy part of a plant used for seasoning and flavoring a recipe, but not used as the main ingredient. What exactly does this mean? Here's an example: Spinach is the green part of a plant, but spinach is a vegetable, not an herb, because spinach is prepared as a food itself, not merely to add flavoring to another food. Similarly, a leaf of lettuce is the green part of a plant, but when you make a salad, the lettuce is the main ingredient, so lettuce isn't an herb either. So What Exactly Is an Herb? Herbs are plants with fragrant or aromatic properties. Herbs can be used to flavor food, included in fragrances, and even a part of natural medicines. Basil, parsley, rosemary, thyme, and dill are all herbs. Note that for each of these, the herb is the green or leafy part of some kind of plant. In the case of basil, the leaves can be quite large, whereas rosemary leaves are more like spines of an evergreen plant. The essential difference between herbs and spices lies with what part of the plant they originate from. An herb is a leaf or other green plant of the plant. Any other element of the plant would be considered a spice—including dried bark, the roots, a berry, seeds, twigs, or other plant matter that is used to season or flavor a dish. For instance, cinnamon is the bark of a tree. Cardamom is a seed pod. Allspice is a dried berry. Cloves are dried flower buds. These are all examples of spices. Note too that spices are used in dried form while herbs can be used either fresh or dried. Many recipes will call for herbs as an ingredient. Be sure to take note if the herbs are dried or fresh. Dried herbs are often added during the cooking process and may be included to impart flavor while cooking. 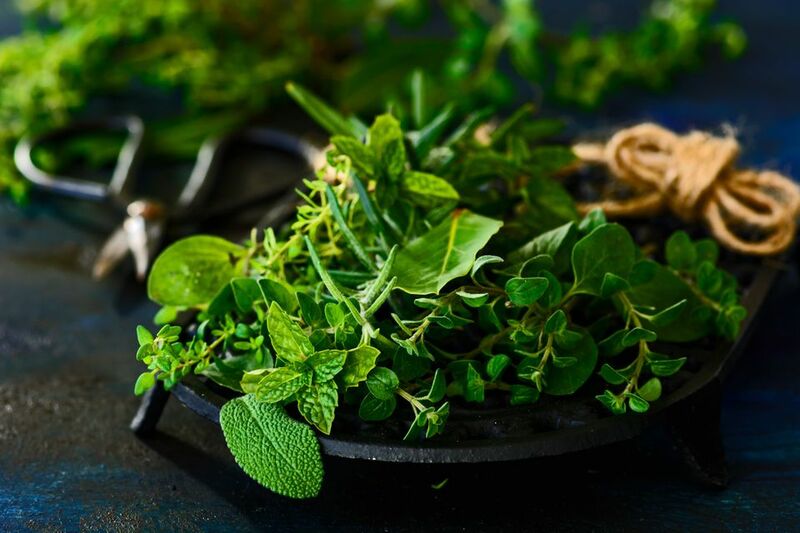 Common dried herbs include oregano, rosemary, sage, and thyme. On the other hand, fresh herbs are often added as the last step once cooking has been completed. Fresh herbs bring brightness and fresh flavor to many recipes. Common fresh herbs are mint, cilantro, and parsley. Some fresh herbs will be one of only a few ingredients in a recipe. For example, a classic pesto recipe relies on fresh basil as the key ingredient. On the other hand, other recipes may call for a simple sprinkling of chopped parsley or cilantro at the end of cooking to bring some bright flavor to the dish. Dried herbs should be stored in their sealed jars in a cool, dark, and dry spice cabinet. Fresh herbs will last the longest if they are washed, carefully dried, gently wrapped in a paper towel, sealed into a ziptop bag, and stored in the refrigerator.